Home > Public Transport > Is Public Transport Always Best? In their headlong rush to lay claim to the environmental high ground, politicians of every hue, from Government Ministers to the Opposition back-benches have sought to extol the virtues of public transport as some kind of green cure for all ills. Despite the rhetoric – some would say inevitably – the promise of the long-awaited fully integrated transport system remains undelivered, at least for the moment. Perhaps in such a near-Utopian world where a truly “joined-up” network exists, the answer to whether public transport is always the best option would be “yes” – said loud and clear, excepting those occasions when you could simply walk or cycle, of course. In the absence of such an ideal world order, deciding if the available public transport really is the best method can often prove difficult, not least because the current debate is often designed around simplistic sound-bites which at best tend to over-simplify the issue. There is, clearly, a broad agreement over the central points of the discussion; buses and trains can help overcome congestion, reduce carbon emissions, offer far higher fuel efficiency per passenger mile than the average car journey and provide socially inclusive forms of transport. The green credentials of public transport have been firmly established – but does this alone mean that they are always best? One thing often forgotten by both Parliament and the urbanite greens is that for many people, particularly those living in rural or remote areas, bus and train services are few and far between – if indeed they exist at all. 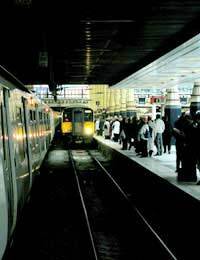 Even if you are lucky enough to live in a place which does enjoy some kind of coverage, timetables and the availability of connections can often make it hard, if not impossible, to use them. Of course it is sometimes possible to overcome these difficulties by adopting our own sort of hybrid, personal approach to integrated transport, shifting from bicycle to bus or from car to train for different parts of the journey, using each to its best – and so doing the least harm. In these cases, circumstances dictate the “best” way to travel, on the simple basis of which one is the most appropriate for any given trip. However, this rather begs the original question regarding public transport itself. Although in some quarters it would be tantamount to environmental heresy to suggest it, in this context the word “always” simply has to go. Even if every village and hamlet in the land were connected to a fully functioning transport network there would always be some trips for which it would not be the best option – unless our vision of Utopia includes simultaneously abandoning out-of-town shopping, for instance. Public transport is good – and some of it very good indeed – but it cannot be the proverbial plaster for every sore. Such a claim is just unfair, not least because the false expectations it raises effectively set the whole thing up to fail. Public transport, however, will always come out on top when it is asked to do what it does best – journeys where luggage and equipment are at a minimum, rather than the monthly supermarket trip or the occasional foray to the DIY or garden centre. Now, while you might argue that out-of-town shopping parks are something which we should not be encouraging, they are a facet of most of our lives – and it seems unlikely that they will be going away anytime soon. Trains are the least polluting form of mass transport and many bus companies are moving to bio-diesel – a cleaner alternative to conventional fossil fuel – or taking the plunge and running zero-emission electric vehicles on short routes. Irrespective of whether you evaluate them by their pollution or by fuel efficiency per passenger mile, trains and buses beat single- occupancy car use hands down – a message which certainly seems to resonate with the nation’s increasingly eco-conscious commuters. According to a recent survey for Barclaycard Business Travel, getting to work by train is now five times more popular than it was just two years ago. In the final analysis, public transport may not always be the best solution, but it will always be a good option and one worth considering first.